Our final wedding cake of the year took me to the gorgeous Gosfield Hall, Essex, for the wedding of Jess and James who chose a wintery, sparkly theme for their cake. Their “twisted design” 4 tier cake consisted of Lovely Lemony Lemon cake, Rich Dark Chocolate, Traditional Fruitcake and the top tier was a dummy tier. The white icing was sprayed with an edible pearl lustre spray for extra sparkle. 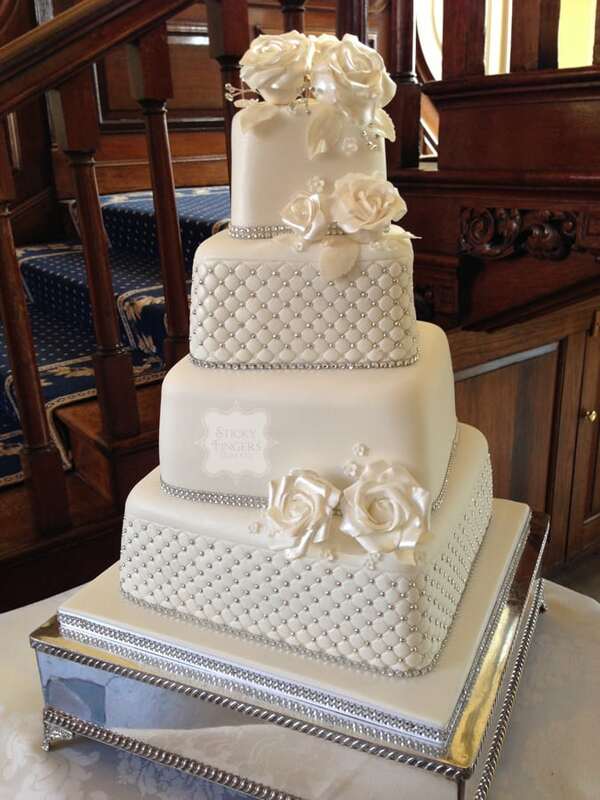 On 2 tiers I made a quilt design, which was punctuated by over 200 silver sugar balls, whilst the cake also included white shimmery roses, diamante detail and a diamante trim. This was by far the most sparkly, shimmery wedding cake I’ve made so far! Love, love, love this cake!